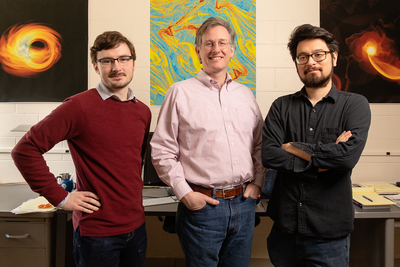 Event Horizon Telescope Project theoretical working group leader Charles Gammie, center, and graduate students Ben Prather, left, and George Wong helped interpret the massive amounts of data used to produce the first image of a black hole. To reach Charles Gammie, call 217-299-1527; gammie@illinois.edu. Click here to view the U. of I. department of physics news release for the Event Horizon Telescope Project announcement.